When we visited Abbey Road in January, Sting confirmed that he had written around thirty songs for The Last Ship project and was still writing. 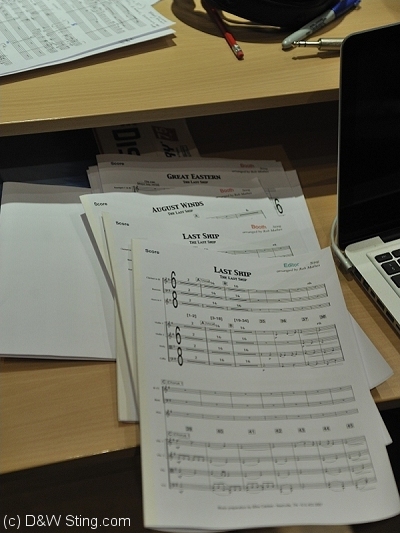 One of these new songs, entitled Ballad Of The Great Eastern, was being worked on at the Abbey Road sessions. The story is of Brunel’s flagship (which many considered to be cursed) and of two men lost during the building of the ship never to be seen again until the discovery of their bodies in a sealed compartment years later. Practical Arrangement, another song that was being worked on in the sessions featured a prominent melodeon sound, had cello added to it over the course of the day adding depth and character to an already moving piece of music. It certainly provoked a strong reaction from those in the room during the recording process: after two takes one of the string players was overhead commenting that Practical Arrangement was "a beautiful song." After lunch in the restaurant and a browse through the studio’s memorabilia there was an opportunity to take some photographs in the empty control room. It wasn’t long before everyone returned refreshed and ready to add some brass to O’Brian’s Hymn. During the recording of the brass section, Sting disappeared into the vocal booth to sing some vocals before returning to the control room and singing along as the brass section worked their magic. Heavy on the brass sound, O’Brian’s Hymn has elements to it that are reminiscent of the work of English composer Elgar. August Winds was described by Rob Mathes as a "glorious" song, and was also praised by the string quartet after completing a couple of takes and coming into the control room to hear the playback. One of the musicians said of August Winds that it’s “hard not to play well on a song as good as that.” During the playback Mathes sat, trance-like, following the take meticulously against his chart, conducting to himself as the song played. Despite the track sounding finished to most, Mathes spotted a small number of parts that could be improved on and a further take was recorded after which he finally expressed his satisfaction, saying the final take "had something magical about it." Parts 1 & 2 of this article may be found at here. Thomas Kilroy's extraordinary adaptation of The Seagull, reimagined in East Galway 1886, reveals a whole new political resonance. The brilliant cast captures the passion and emotional currents of Chekhov’s wonderful play. Legendary director Max Stafford-Clark promises, “You won’t have seen this before.” Click here to purchase tickets for the limited run of this groundbreaking play. Running from October 3 - November 3 in NYC!